If youâ€™re in search of discount office furniture for a business in the Orlando, Florida, area, thereâ€™s no need to sacrifice quality for affordability if you simply turn to the professionals at ROF. We pride ourselves on offering used and refurbished/remanufactured office furniture (in addition to new furniture) that is both of high-quality and highly affordable. In fact, when shopping with us, you have the ability to save up to 80 percent off the original manufacturerâ€™s price. And, since we offer furniture crafted from all of the leading names in the industry, including Haworth, Allsteel, Indiana Furniture, HON, Steelcase, and more, our discount office furniture is an incredible value. Another way we ensure the quality of our preowned furniture is we have each piece meticulously inspected by our staff members before it is put up for sale. If any part of the furniture is not up to our standards, we will have our in-house refurbishment team restore it. This team will also be able to customize parts of the furniture for you to better suit your office, such as altering the colors on the cubicle panels to your businesses colors. Contact ROF today to inquire about the furniture we currently have in stock or feel free to stop by our 140,000 square foot warehouse to see our inventory for yourself. 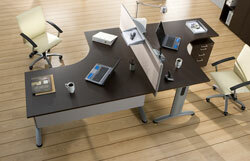 We are proud to serve discount office furniture to businesses in Orlando, FL, and throughout the region.